Thanks for following along for another week! Hog markets are showing some promise after a rough start to the week. April hogs, being the long anchor of our trading lately has been tied to a weak cash market. For the week we saw what we believe is a bottom in the ham and belly market for the short term. 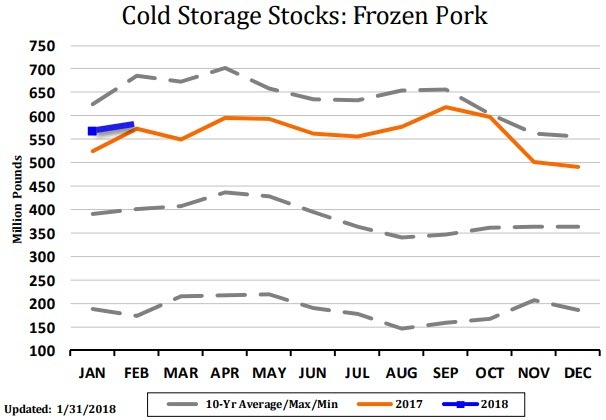 Cold storage numbers showed stocks a little higher than a year ago, although much of that was in the ham market. Belly stocks are near 44 million pounds, we think we need around 70 million by the summer to meet demand, so packers have work to do. Given Easter is on the horizon, it feels as if have a seen a bottom in that market short term as retailer swoop in to buy the break. The result has the index closing well off the lows from last week. The trend into this time last year was higher. Belly prices have also performed well, which should support bottoming in the April contract. We remain cautious of the outright long April position given the cash discount to April futures, but we feel the front of the curve is where we want to be given the outlook for fantastic exports and belly demand over the coming weeks. Yes pork supplies are higher than a year ago, but not by much. 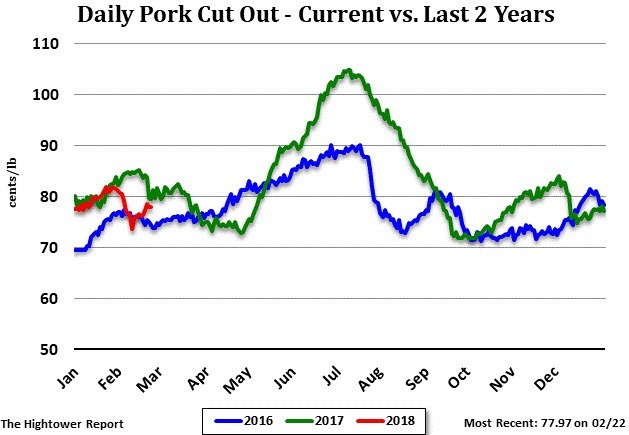 Pork supplies look to be rather large at the beginning of Q4, we will anchor our trade with short positions out that far for now. We never traded 12.00 even on the J-Q spread, if you did not get out of the position today try it on the open Monday at OR near that level. I know many of you did exit, which I feel is a good decision. We made a small amount of money on that trade, more importantly the J-V is on the move higher. Thanks for following along. UNTIL NEXT WEEK!